For this lesson we study chapter III (sub-chapter 6. 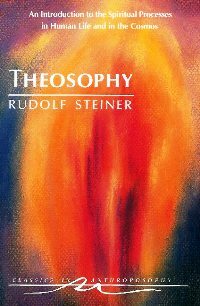 Thought Forms and the Human Aura) of "Theosophy" by Rudolf Steiner. "It has been said that the formations of any one of the three worlds can have reality for man only when he has the capacities or the organs for perceiving them. He perceives certain occurrences in space as light phenomena only because he has a correctly constructed eye. How much of what really exists reveals itself to a being depends upon his receptivity. A man, therefore, should never say that what is real is only what he can perceive. Much can be real that he cannot perceive for lack of organs." What are these organs of perception if they are not our physical organs of perception? Much of our deliberations should focus around this and related questions. "Exactly as occurrences in space can be seen with the sensory eye as color phenomena, so can the above named soul and spiritual occurrences become, by means of the inner senses, perceptions that are analogous to the sensory color phenomena." 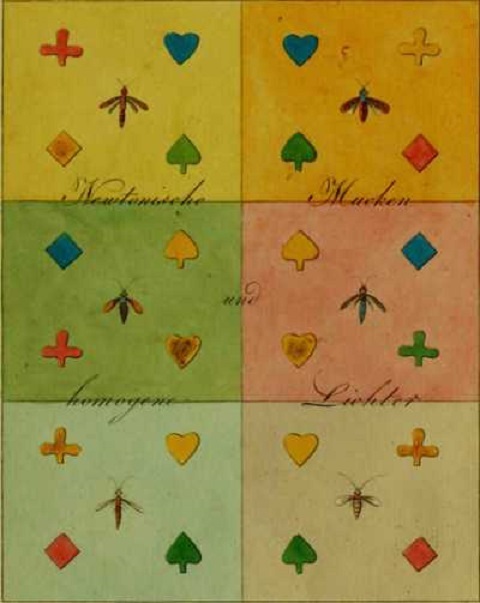 In the second part of the sub-chapter Steiner relates how the thoughts and feelings "translate" into color phenomena, and - not surprisingly - we can come to an understanding of how colors reflect and influence our inner being. Color therapy naturally works with this realization. "The history of color therapy is very ancient. This system of therapy was prevalent not only in India but also in Egypt, China, Greece and Persia. Even the Vedas and Jain scriptures have mentioned the significance of colors. The practice of color therapy was on its decline in the Middle Ages, and new systems of medicine like Ayurveda, Unani, Homoeopathy, Allopathy had started flourishing, attracting people's attention while color therapy took a back seat. Color therapy and healing (also known as chromotherapy or light therapy) is a type of holistic healing that uses the visible spectrum of light and color to affect a person’s mood and physical or mental health. Each color falls into a specific frequency and vibration, which many believe contribute to specific properties that can be used to affect the energy and frequencies within our bodies." "By means of a more highly developed spiritual vision three aspects of color phenomena can be distinguished within the aura radiating and surging round a person. Firstly, there are colors that bear more or less the character of opaqueness and dullness. Certainly, if we compare them with colors seen with our physical eyes, they appear fugitive and transparent in comparison. Within the supersensible world itself, however, they make the space that they fill, comparatively speaking, opaque. They fill it in the manner of mist formations. A second species of colors consists of those that are light itself, as it were. They light up the space they fill so that it becomes through them itself a space of light. Color phenomena of the third kind are quite different from the first two. They have a raying, sparkling, glittering character. They fill space not merely with light but with glistening, glittering rays. There is something active and inherently mobile in these colors. The others are somewhat quiet and lack brilliance. These, on the contrary, continuously produce themselves out of themselves, as it were. Space is filled by the first two species of colors with a subtle fluidity that remains quietly in it. By the third, space is filled with an ever self-enkindling life, with never resting activity. These three species of colors, however, are not ranged alongside each other in the human aura. They are not each enclosed in a separate section of space, but they interpenetrate and suffuse each other in the most varied ways. All three species can be seen playing through each other in one region of the aura, just a physical body, such as a bell, can simultaneously be heard and seen. The aura thus becomes an exceedingly complicated phenomenon because we have to do with three auras within each other, interpenetrating each other. We can, however, overcome the difficulty by directing our attention to the three species alternately. In the supersensible world we then do something similar to what we do in the sensible, for example, when we close our eyes in order to give ourselves up fully to the impressions of a piece of music. The seer has three different organs for the three species of color, and in order to observe undisturbed, he can open or close any one of the organs to impressions. As a rule only one kind of organ can at first be developed by a seer, namely, the organ for the first species of color. A person at this stage can see only the one aura; the other two remain invisible to him. In the same way a person may be accessible to impressions from the first two but not from the third. The higher stage of the gift of seeing consists in a person's being able to see all three auras, and for the purpose of study to direct his attention to the one or the other. The threefold aura is thus the supersensibly visible expression of the being of man. The three members, body, soul and spirit, come to expression in it. The first aura is a mirror of the influence the body exercises on the human soul; the second characterizes the life of the soul itself, the soul that has raised itself above the direct influence of the senses, but is not yet devoted to the service of the eternal; the third mirrors the mastery the eternal spirit has won over the transitory man. When descriptions of the aura are given, as here, it must be emphasized that these things are not only difficult to observe but above all difficult to describe. No one, therefore, should see in a description like this anything more than a stimulus to thought." " ... (firstly), there are colors that bear more or less the character of opaqueness and dullness. Certainly, if we compare them with colors seen with our physical eyes, they appear fugitive and transparent in comparison. Within the supersensible world itself, however, they make the space that they fill, comparatively speaking, opaque. They fill it in the manner of mist formations. A second species of colors consists of those that are light itself, as it were. They light up the space they fill so that it becomes through them itself a space of light. Color phenomena of the third kind are quite different from the first two. They have a raying, sparkling, glittering character. They fill space not merely with light but with glistening, glittering rays. There is something active and inherently mobile in these colors. The others are somewhat quiet and lack brilliance. These, on the contrary, continuously produce themselves out of themselves, as it were. Space is filled by the first two species of colors with a subtle fluidity that remains quietly in it. By the third, space is filled with an ever self-enkindling life, with never resting activity." Tasks and Assignments for Lesson FS 2.12. 1. Create a short summary of the sub-chapter in your own words. 2. Steiner speaks in this sub-chapter about "perception" of the aura of the human being. How is this perception to be understood? 3. Imagine you have been hired by the local Waldorf school as the public relations coordinator (at a very decent salary, plus you are very highly motivated). Your task is to respond via a public statement (press release) to be printed in the local newspaper concerning the allegations that at your school, decisions about admissions of students are based on the registrar's ability to perceive and judge the children's auras. Please create such a public statement. 4. Paint a color wheel and submit the resulting artwork. It has been said that the formations of any one of the three worlds can have reality for man only when he has the capacities or the organs for perceiving them. He perceives certain occurrences in space as light phenomena only because he has a correctly constructed eye. How much of what really exists reveals itself to a being depends upon his receptivity. A man, therefore, should never say that what is real is only what he can perceive. Much can be real that he cannot perceive for lack of organs. Now, the soul world and the spirit world are just as real as the sensory world. Indeed, they are real in a much higher sense. No physical eye can see feelings and thoughts, yet they are real. Just as man by means of his outer senses has the corporeal world before him as an object of perception, so do feelings, instincts, and thoughts become objects of perception for his spiritual organs. Exactly as occurrences in space can be seen with the sensory eye as color phenomena, so can the above named soul and spiritual occurrences become, by means of the inner senses, perceptions that are analogous to the sensory color phenomena. To understand fully in what sense this is meant is only possible for one who has followed the path of knowledge described in the following chapter and has as a result developed his inner senses. For such a person the psychic phenomena in the soul region surrounding him, and the spiritual phenomena in the spiritual region, become supersensibly visible. The feelings of other beings that he experiences ray out to him from them like light phenomena, and thoughts to which he directs his attention surge through spiritual space. For him, the thought of one man about another is not something imperceptible but, on the contrary, is a perceptible occurrence. The content of a thought lives as such only in the soul of the thinker, but this content excites effects in the spirit world. They are the perceptible occurrence to the spiritual eye. The thought streams out as an actual reality from one man and flows to the other, and the way this thought acts on the other person is experienced as a perceptible occurrence in the spiritual world. Thus the physically perceptible man is only part of the whole man for the one whose spiritual senses are unfolded. This physical man becomes the center of soul and spiritual outpourings. It is impossible to do more than faintly indicate the richly varied world that discloses itself here to the seer. A human thought, which otherwise lives only in the understanding of the listener, appears, for example, as a spiritually perceptible color phenomenon. Its color corresponds with the character of the thought. A thought that springs forth from a sensual impulse in a person has a different color from a thought conceived in the service of pure knowledge, noble beauty or the eternally good. Thoughts that spring from the sensual life course through the soul world in shades of red. A thought by which the thinker rises to higher knowledge appears in beautiful light yellow. A thought that springs from devoted and unselfish love rays out in glorious rose red. Just as the content of a thought comes to expression in its supersensibly visible form, so also does the greater or lesser degree of its definiteness. The precise thought of the thinker shows itself as a formation with definite outlines; the confused idea appears as a wavering, cloudy formation. In this way the soul and spirit nature of man appear as the supersensible part of the whole human being. The color effects perceptible to the spirit eye that ray out around the physical man observed in his activity, and that envelop him like a somewhat egg-shaped cloud, are the human aura. The size of this aura varies in different people, but we may say that the entire man appears on the average twice as long and four times as wide as the physical man. The most varied shades of color flood the aura. This color flooding is a true picture of the inner human life. As this changes, so do the shades of color change. Certain permanent qualities such as talents, habits and traits of character, however, express themselves also in permanent fundamental color shades. Misunderstandings can arise in men who at present stand remote from the experiences of the path of knowledge described in a later chapter of this book — in regard to the nature of what is here described as the aura. We might imagine that what are here described as colors would stand before the soul just as the physical colors stand before the physical eye, but such a soul color would be nothing but hallucination. Spiritual science is not in the least concerned with hallucinatory impressions, and they are, in any case, not what is meant in the description now before us. We reach a correct conception if we keep the following in mind. With a physical color, the soul experiences not only the sense impression, but through it, it has a soul-experience. When through the eye the soul perceives a yellow surface, this soul-experience is different from what it is when it perceives a blue surface. One may call this experience “living in yellow” or “living in blue.” Now the soul that has followed the path of knowledge has a similar “experience in yellow” when observing the active soul-experience of other beings; an “experience in blue” when observing devotional soul-moods. The essential thing is not that the seer in visualization of another soul sees blue just as he sees this blue in the physical world, but that he has an experience that justifies his calling the visualization blue; just as the physical man calls a curtain blue, for instance. Further, it is essential that the seer should be conscious of standing in an experience free of the body so that he gains the possibility of speaking about the value and the meaning of the soul-life in a world whose perception is not mediated through the human body. Although this meaning of the description must be taken into account, yet it is altogether a matter of course for the seer to speak of blue, yellow, green, and so forth, in the aura. The aura varies greatly according to the different temperaments and dispositions of people. It likewise varies in accordance with the stages of spiritual development. A man who yields completely to his animal impulses has an entirely different aura from one who lives much in the world of thought. The aura of a religiously disposed nature differs essentially from one that loses itself in the trivial experiences of the day. In addition to this, all varying moods, all inclinations, joys and pains, find their expression in the aura. We have to compare the auras of various soul-experiences with each other in order to learn to understand the meaning of the color shades. To begin with, take soul-experiences shot through with strongly marked emotions. They may be divided into two kinds — those in which the soul is impelled to these emotions chiefly by the animal nature, and those in which these passions take a more subtle form, in which they are, so to speak, strongly influenced by reflection. In the first kind of experiences brown and reddish-yellow streams of color surge through the aura in definite locations. In persons with more subtle passions there appear in the same locations brighter reddish-yellow and green shades. One can notice that as intelligence increases the green shades become more frequent. Persons who are very intelligent, but who give themselves over entirely to satisfying their animal impulses, show much green in their aura, but this green will always have an admixture more or less of brown or brownish-red. Unintelligent people show a great part of their aura permeated by brownish-red or even by dark blood-red currents. The auras of quiet, meditative, thoughtful soul-moods are essentially different from those of such passionate conditions. The brownish and reddish tones become less prominent and various shades of green emerge. In strenuous thinking the aura shows a pleasing green undertone. This is to a special degree the appearance of those natures who know how to adapt themselves to every condition of life. Shades of blue appear in soul-moods full of devotion. The more a man places his self in the service of a cause, the more pronounced become the blue shades. In this class also one finds two quite different kinds of people. There are natures who are not in the habit of exerting their power of thought — passive souls who, as it were, have nothing to throw into the streams of events in the world but their good nature. Their aura glimmers with beautiful blue. This is also the appearance of many religious and devotional natures. Compassionate souls and those who find pleasure in giving themselves up to a life of benevolence have a similar aura. If such people are intelligent in addition, green and blue currents alternate, or the blue itself perhaps takes on a greenish shade. It is the peculiarity of the active souls in contrast to the passive, that their blue saturates itself from within with bright shades of color. Inventive natures, having fruitful thoughts, radiate bright shades of color as if from an inner center. This is true to the highest degree in those persons whom we call wise, and especially in those full of fruitful ideas. Generally speaking, all that implies spiritual activity takes more the form of rays spreading out from within, while everything that arises from the animal nature has the form of irregular clouds surging through the aura. The variations in color nuances showing themselves in the corresponding aura formations depend on whether thoughts, sprinting from the soul's activity, are at the service of the soul's animal nature or that of an ideal, objective interest. The inventive person who applies all his thoughts to the satisfaction of his sensual passions shows dark blue-red shades. He, on the contrary, who places his thoughts selflessly at the service of an interest outside himself shows light reddish-blue color tones. A spiritual life combined with noble devotion and capacity for sacrifice shows rose-pink or light violet colors. Not only does the fundamental disposition of the soul show its color surgings in the aura, but also transient passions, moods and other inner experiences. A violent anger that breaks out suddenly creates red streams; feelings of injured dignity that expend themselves in a sudden welling up can be seen appearing in dark green clouds. Color phenomena, however, do not appear only in irregular cloud forms but also in distinctly defined, regularly shaped figures. If we observe a man under the influence of an attack of fear, we see this, for instance, in his aura from top to bottom as undulating stripes of blue color suffused with a bluish-red shimmer. When we observe a person who expects some particular event with anxiety, we can see red-blue stripes like rays constantly streaming through his aura from within outwards. Every sensation received from without can be observed by the one who has developed the faculty of exact spiritual perception. Persons who are greatly excited by every external impression show a continuous flickering of small bluish-red spots and flecks in the aura. In people who do not feel intensely, these flecks have an orange-yellow or even a beautiful yellow coloring. So-called absent-mindedness shows bluish flecks playing over into green and more or less changing in form. By means of a more highly developed spiritual vision three aspects of color phenomena can be distinguished within the aura radiating and surging round a person. Firstly, there are colors that bear more or less the character of opaqueness and dullness. Certainly, if we compare them with colors seen with our physical eyes, they appear fugitive and transparent in comparison. Within the supersensible world itself, however, they make the space that they fill, comparatively speaking, opaque. They fill it in the manner of mist formations. A second species of colors consists of those that are light itself, as it were. They light up the space they fill so that it becomes through them itself a space of light. Color phenomena of the third kind are quite different from the first two. They have a raying, sparkling, glittering character. They fill space not merely with light but with glistening, glittering rays. There is something active and inherently mobile in these colors. The others are somewhat quiet and lack brilliance. These, on the contrary, continuously produce themselves out of themselves, as it were. Space is filled by the first two species of colors with a subtle fluidity that remains quietly in it. By the third, space is filled with an ever self-enkindling life, with never resting activity. These three species of colors, however, are not ranged alongside each other in the human aura. They are not each enclosed in a separate section of space, but they interpenetrate and suffuse each other in the most varied ways. All three species can be seen playing through each other in one region of the aura, just a physical body, such as a bell, can simultaneously be heard and seen. The aura thus becomes an exceedingly complicated phenomenon because we have to do with three auras within each other, interpenetrating each other. We can, however, overcome the difficulty by directing our attention to the three species alternately. In the supersensible world we then do something similar to what we do in the sensible, for example, when we close our eyes in order to give ourselves up fully to the impressions of a piece of music. The seer has three different organs for the three species of color, and in order to observe undisturbed, he can open or close any one of the organs to impressions. As a rule only one kind of organ can at first be developed by a seer, namely, the organ for the first species of color. A person at this stage can see only the one aura; the other two remain invisible to him. In the same way a person may be accessible to impressions from the first two but not from the third. The higher stage of the gift of seeing consists in a person's being able to see all three auras, and for the purpose of study to direct his attention to the one or the other. The threefold aura is thus the supersensibly visible expression of the being of man. The three members, body, soul and spirit, come to expression in it. The first aura is a mirror of the influence the body exercises on the human soul; the second characterizes the life of the soul itself, the soul that has raised itself above the direct influence of the senses, but is not yet devoted to the service of the eternal; the third mirrors the mastery the eternal spirit has won over the transitory man. When descriptions of the aura are given, as here, it must be emphasized that these things are not only difficult to observe but above all difficult to describe. No one, therefore, should see in a description like this anything more than a stimulus to thought. Thus, for the seer, the peculiarity of the soul's life expresses itself in the constitution of the aura. When he encounters a soul life that is given up entirely to passing impulses, passions and momentary external incitements, he sees the first aura in loudest colors; the second, on the contrary is only slightly developed. He sees in it only scanty color formations, while the third is barely indicated. Only here and there a small glittering spark of color shows itself, indicating that even in such a soul-mood the eternal already lives in man as a germ, but that it is driven into the background by the action of the sensory nature as has been indicated. The more a man gets rid of his lower impulses, the less obtrusive becomes the first part of the aura. The second part then grows larger and larger, filling the color body within which the physical man lives ever more completely with its illuminating force. The more a man proves himself to be a servant of the eternal, the more does the wonderful third aura show itself to be the part that bears witness to the extent to which he has become a citizen of the spiritual world because the divine self radiates into the earthly life through this part of the human aura. Insofar as men show this aura, they are flames through whom the Godhead illumines this world. They show through this part of the aura how far they know how to live not for themselves, but for the eternally True, the nobly Beautiful and the Good. They show how far they have wrung from their narrower self the power to offer themselves up on the altar of cosmic world activity. Thus there comes to expression in the aura what a man has made of himself in the course of his incarnation. 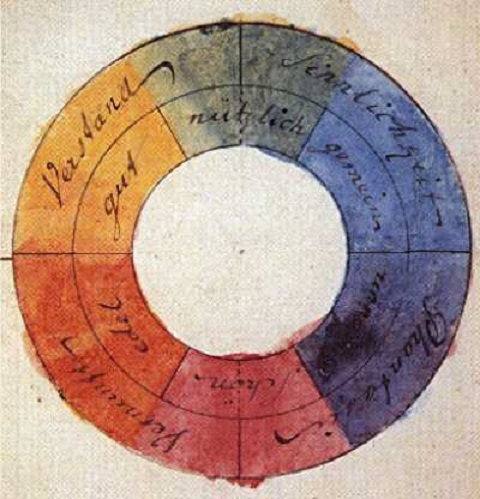 All three parts of the aura contain colors of the most varied shades, but the character of these shades changes with the stage of man's development. In the first part of the aura there can be seen the undeveloped life of impulse in all shades from red to blue. These shades have a dull, muddy character. The obtrusive red shades point to the sensual desires, to the fleshly lusts, to the passion for the enjoyments of the palate and the stomach. Green shades appear to be found especially in those lower natures that incline to obtuseness and indifference, greedily giving themselves over to each enjoyment, but nevertheless shunning the exertions necessary to bring them to satisfaction. Where the desires are passionately bent on some goal beyond the reach of the capacities already acquired, brownish-green and yellowish-green auric colors appear. Certain modern modes of life actually breed this kind of aura. A personal conceit that is entirely rooted in low inclinations, thus representing the lowest stage of egotism, shows itself in tones of muddy yellow to brown. Now it is clear that the animal life of impulse can take on a pleasing character. There is a purely natural capacity for self-sacrifice, a high form of which is to be found even in the animal kingdom. This development of an animal impulse finds its most beautiful consummation in natural mother love. These selfless natural impulses come to expression in the first aura in light reddish to rose-red shades of color. Cowardly fear and timidity in the face of external causes show themselves in the aura in brown-blue and grey-blue colors. The second aura again shows the most varied grades of colors. Brown and orange colored formations point to strongly developed conceit, pride and ambition. Inquisitiveness also announces its presence through red-yellow flecks. A bright yellow mirrors clear thinking and intelligence; green expresses understanding of life and the world. Children who learn easily have much green in this part of the aura. A green yellow in the second aura seems to betoken a good memory. Rose-red indicates a benevolent, affectionate nature; blue is the sign of piety. The more piety approaches religious fervor, the more does the blue pass over into violet. Idealism and an earnest view of life in a higher sense is to be seen as indigo blue. The fundamental colors of the third aura are yellow, green and blue. Bright yellow appears here if the thinking is filled with lofty, comprehensive ideas that grasp the details as part of the whole of the divine world order. If the thinking is intuitive and also completely purified of all sensuous visualizations, the yellow has a golden brilliance. Green expresses love towards all beings; blue is the sign of a capacity for selfless sacrifice for all beings. If this capacity for sacrifice rises to the height of strong willing, devoting itself to the active service of the world, the blue brightens to light violet. If pride and desire for honor, as last remnants of personal egoism, are still present despite a more highly developed soul nature, others verging on orange appear beside the yellow shades. It must be remarked, however, that in this part of the aura the colors are quite different from the shades we are accustomed to see in the world of the senses. The seer beholds a beauty and an exaltedness with which nothing in the ordinary world can be compared. This presentation of the aura cannot be rightly judged by anyone who does not attach the chief weight to the fact that the seeing of the aura implies an extension and enrichment of what is perceived in the physical world — an extension, indeed, that aims at knowing the form of the soul life that possesses spiritual reality apart from the world of the senses. This whole presentation has nothing whatever to do with reading character or a man's thoughts from an aura perceived in the manner of a hallucination. It seeks to expand knowledge in the direction of the spiritual world and has nothing in common with the questionable art of reading human souls from their auras.